Join the Rally! and Bring a Friend! 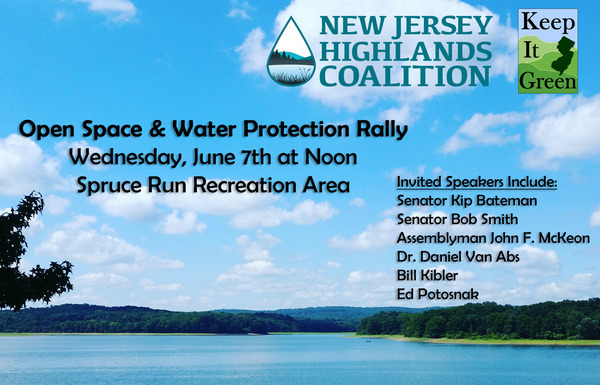 Please join us at our Open Space and Water Protection Rally from noon to 1 PM on Wednesday, June 7th at Spruce Run Recreation Area. We will have some great speakers including Senator Kip Bateman (invited), Senator Bob Smith (invited) and Assemblyman John F. McKeon (invited); former Director of Science & Planning for the New Jersey Highlands Council & Rutgers Associate Research Professor, Dr. Daniel Van Abs, Bill Kibler, Policy Director of the Raritan Headwaters Association, Ed Potasnak Executive Director of the New Jersey League of Conservation Voters among others! Directions/Parking: The address for the event is 69 Van Syckles Rd. Clinton, NJ. Once at the recreation area please check in at the guard house and let them know you are attending the Highlands Coalition Event (we will be paying for parking for the event so the guards will need a head count) then proceed to the stone house overlooking the reservoir which the guards can direct you to. Let us know if you have any questions and we would be delighted if you could join us for the rally!